How subscribing to others blog can help you to grow traffic? How Subscribing to others blog has got me more Traffic? You must be thinking that how subscribing to others blogs and websites has helped me to get some extra traffic to my blog. Well, Today in this post of mine I will explain to you that how subscribing to others blog provided me more traffic and also helped me to generate more revenue for my blog. You can say that it is a two-way process and both the bloggers can subscribe to each other and get updates and make comments to grow their traffic. I have subscribed to my fellow bloggers and makes comments on their new posts. And you can do that too. But there are some points which I would like to share with you. We can be the first commenter on their blog. Secondly, we get an update about if something which could help to grow our Blog or sometimes even better than that. There are many famous bloggers whom I have subscribed like Neil Patel, Brian Dean, Enstine Muki, Philip Varghese Ariel and some more are there. As I focus on a single niche blog instead of a Multi niche blog, so I follow those blogs who share about WordPress, SEO, Internet marketing and something similar to it. But you can subscribe to those blogs or sites which belong to your topic or niche. Or you can even subscribe to those websites which interest you. Like I have also subscribed to the sites which share content about food and new recipes. When I was a newbie in the field of blogging or whenever I start a new blog, I made comments to be my secret weapon. And many bloggers like Harsh Aggarwal say’s that try to comment on the others blogs and try to be the first commenter on their posts. Making comments on others blog will help them to recognize you, and many of the good bloggers will return the favor and become one of the visitors of your blog, and as a result, your blog’s traffic will be increased. If you are a new blogger, then I advise you to try to be the first commenter on your competitor’s posts or some of the other bloggers latest blogs posts. And mark my Words that once you are on the list of the top bloggers, comment on the top bloggers latest posts and you will see the difference with your blog traffic. And also reply to their comments on their post, I mean doing a long chat on the top blogger’s post with them will help the admin of the blog and other commenters notice you easily. And surely there will be many bloggers who will recognize and count you as one of the experienced and top bloggers. Thus, resulting in a boost of traffic. Many bloggers try to do the commenting in mass, reaching the people in a large quantity but this could end up in a manual penalty by Google. Although, I have written a post on how to get your comments approved and I am sure that it will help you with commenting for sure. For getting more comments many bloggers are using Commentluv enabled blogs, so you can also use the CommentLuv plugin to get some more comments. There are websites and blogs which provide the information about the latest trends going on the internet about your niche. As for getting updates about the Google’s updates I have subscribed to the Search engine land and marketing land and some of the more sites like these. These sites provide the updates about the Google’s algorithm, as we know that Google makes more than 400 changes per year and these sites provide the all essential information needed to rank on Google first Page. And sometimes these sites provide more than the needed information; they also post something good through which can we make our website better and rank on Google SERPs. I have been using these sites from the day I started doing SEO and internet marketing. I personally have learned many new things through subscribing to others blogs and websites. And there is no doubt that you can also learn many new things. When you subscribe to the others websites, you will surely be getting the post they are going to share, and in every post, there might be something new. So, I personally read all the post, and I will also recommend you to subscribe and read the posts of others bloggers to learn new things. 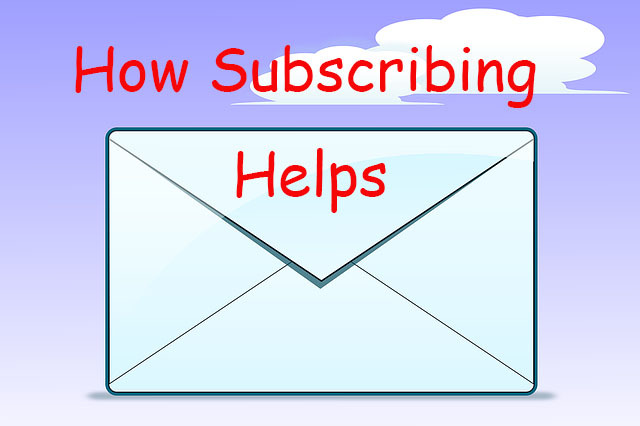 There is no doubt that subscribing has helped me to grow my blog. I am able to grow my blog with more visitors and sometimes with more inspirations from the others post. Now, it’s your turn to tell me that how subscribing has helped you. Give me your opinion about it through your comments. WordPress Vs. Blogspot – Which one should you choose? How to Choose Right Web Hosting to host your website? Excellent tip and I totally agree. Good blogs have good information (like this one!) and so it makes total sense to subscribe to such blogs! It’s a great way to stay current and get the pulse of what’s going on in the industries of SEO, WordPress, Blogging, etc. And, of course, I love commentluv enable blogs like this one, as an added bonus! Yeah, comment Luv is really good and attracts more commenters for sure. I subscribe to a number of top bloggers just to read their articles. It did not really occur to me to make comments on others blogs to help get recognized by them. I have found that many good bloggers have returned the favor, and have become visitors of my blogs. Good point on being the first person to leave a comment. Great article. I will share it! Oh, yes the first commenter is always attracted by the commenters and the admin of the blog. And thanks for sharing it. a great Idea ,the way you explain this here makes sense. new interesting content and also have more visitors. Good to think about and follow your advice. I am glad that you are going to follow my advice. And thanks for the kind words and share. Yet another wonderful information in relation to blogging and traffic. Yes, subscribing fellow bloggers page is an excellent idea to get more exposure to our pages, it is said and noted that just subscribing and leaving as it is will not do any good. Instead immediately after receiving the notification about a new post in your mail from the subscribed page, just jump in to check what it is all about and if it’s your interested subject go through well the shared content and post your views, not with just a one line comment or a word like “Great” Excellent, Fantastic etc… instead, share your views with a constructive comment, if you do not agree with any of the points mentioned in the post, or something vital missed in the post etc. tell it out politely and say this is what i feel, say this is what i want to add. if the writer agrees or even disagrees he will surely reply to your comment and makes way to start a discussion or debate with the readers of that page/post. This type of engagement will help you in a measure to get to know you by the new readers about you and your page. If you do this as a first or first few comment authors I am sure you get more attention by the visitors of that blog. It is worth mentioning you. Because I have learned many new things through you and you are a great help. So, thanks the sharing your opinion about my post. I just want to say that this post is amazing. Practical advice with visuals and so much helpful information. This is a wonderful surprise. Thanks for the mention in this well-thought post. Thanks again for being a loyal subscriber. I’m on Neil’s list (and a couple of others) and I can say boldly that I’m glad to be on their lists. These advantages you shared here are very correct. I also sign up to some lists to get closer to the bloggers. Once I receive their mails, I’ll send them a friendly reply. That often gets me noticed and draws us closer. Thanks for the sharing your experience with us. Surely sending a friendly reply through email works. And also thanks for dropping a comment. You too have a good week ahead. Very impressive trick indeed. Among all circumstances, what I liked the most is ‘being the first commenter’ one. It helps you to catch other eyes towards you. Very helpful and certainly unusual tips. Thanks for sharing. Valuable post. I also blogged about these concepts but felt you elaborated on them. You definitely brought more to the table. Thanks for the feedback. Those two bloggers are really good and help others whenever possible and there is no doubt that they are famous. Hi Robin, Basically, I am using your methods and I have got more benefits. Today you have shared another helpful knowledge. I like it. Thanks for shared. I am Glad that you are following my methods and those methods are even helping you. Have a good week ahead. Great Tips Robin, subscribing other fellow bloggers blog not only strengthen relationships but also gives additional information. I have subscribed almost 50+ bloggers blog post and that helped me to learn digital marketing and blogging. It’s nice you mentioned some great bloggers like Neil, Enstime, Philp, etc. Its great to learn from them. I am glad that you liked the post. Keep visiting and Have good week ahead. I am glad that you are going to subscribe to the best blogs out there. Have a good week ahead. I thought this is the first visited your blog. Nice to meet you today! You know? When I first start blogging, I don’t love to subscribe to other blogs as I boring with products advertising and lazy in reading post. It’s some kind of stupid mistake which I ever did in blogging life. No blogger could success without habit of enjoying reading and sharing. It’s the reason, I delayed my success for almost 3 years. I always share this mistakes on the blogs, but now I found someone who have the same opinion here. Subscribe to other authorities bloggers’s blog help to improve knowledge and get the opportunity to build the community. If you always to first commentator on those blog, I believe that those fortune bloggers will recognize you faster than others. The most important is, the first commentator always get more conversion than the later commentators. Did you agree me? subscribing to others blogs alway to get more visitors and expand our knowledge. And I completely agree with your that being the first commenter we are always recognized by the owner of the blog and other blog commenters. Subscribing to other blogs is important but it doesn’t necessarily have to be through their mailing list. I like to follow my favorite bloggers – for the reasons you outlined – using a central reader instead. While I subscribe to many blogs, I NEVER thought about using those notifications to use to try to be one of the first commentors on a post. What a simple, yet I’m sure so-overlooked tip! Thanks for the kind words Deborah. have a good day. Hey Robin, it’s nice to visit your blog and this is the first time I am doing so, thanks to Francis for sharing your post on Twitter where I found it. You shared excellent tips here on subscribing to famous blogs and I will be applying to my own blog too. Thanks for sharing what works for you man. You are welcome to my Blog. And I am sure subscribing to some of the famous bloggers will help you.